Heat loss in divers is an ever present, silent enemy. Rarely, if ever, do dive conditions exist where body heat loss does not occur. For heat loss to match heat production, water temperatures must range between 91°F and 95°F. That means, regardless of how warm it feels, unless water temperature is greater than 90°F, a diver will experience heat loss. Heat loss is insidious; it sneaks up with little warning. It often displays no painful or obvious symptoms. It may gradually impair coordination and drain energy reserves at a time when they are needed most. Thinking and judgment can be impaired in ways so subtle that a diver may not be aware that something is wrong - until it is too late. The heaters are available from 25 Watts to 100 Watts. This is a lot of heat considering that the human body produces in the relaxed condition, only about 60 Watts of heat. With the proper heater you can dive wet in North Pole waters and enjoy unprecedented comfort. Supplemental heat is the future of diving! 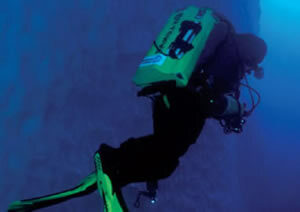 Aqua Heat lets you extend your dive season for year-round diving in oceans, lakes, or quarries. Stamina, alertness, dexterity, and coordination will not be compromised by the numbing loss of body heat. Diving with Aqua Heat is less stressful, more enjoyable, and much safer. Aqua Heat is a simple, durable, and inexpensive heating device any diver can afford. The silicone heating pad(s) is placed inside a wet or dry suit and rests on the front torso above the waist line or on the lower back. For even more heat, use one on the front and one on the back. Each system includes detailed instructions how to install the pads and the battery packs, how to provide an electrical connection to the pads in the wet suit and how to install leak-free electrical bulkhead connector through a dry suit. Before entering the water, the diver connects the heater to the battery by a simple quick-disconnect device. Connection and disconnection are easy even when wearing the thickest gloves or mitts. Each system also incorporates an ON/OFF switch to control the heater when needed. The amphibious Aqua Heat can also be used during surface intervals to maintain body temperature topside, too! By selecting a different temperature output heater or heaters, you can dive anytime, anywhere, and stay warm. Aqua Heat component flexibility provides safety and warmth at all diving temperatures. With Aqua Heat you don't have to keep moving to maintain body heat. You can move more slowly to see more, take better pictures, or spear bigger fish. Being warm will increase your bottom time, because you consume less air. Diving should be fun. Shouldn't you be comfortable in and out of the water? Don't let the cold water or chilly wind limit your enjoyment. Because Aqua Heat is available in many output levels, it will make you comfortable in all types of diving. When the water temperature is less than ideal, don't wait to dive. With Aqua Heat you can dive whenever and wherever you want.